LONG FLIGHTS ARE ESSENTIAL to get to some of the most far out places on the planet. So, even though the entire experience of the trip can be exciting, the flight is what is dreaded by most. How are you supposed to keep yourself entertained in a tiny air space, thousands of feet off the ground, surrounded by strangers? 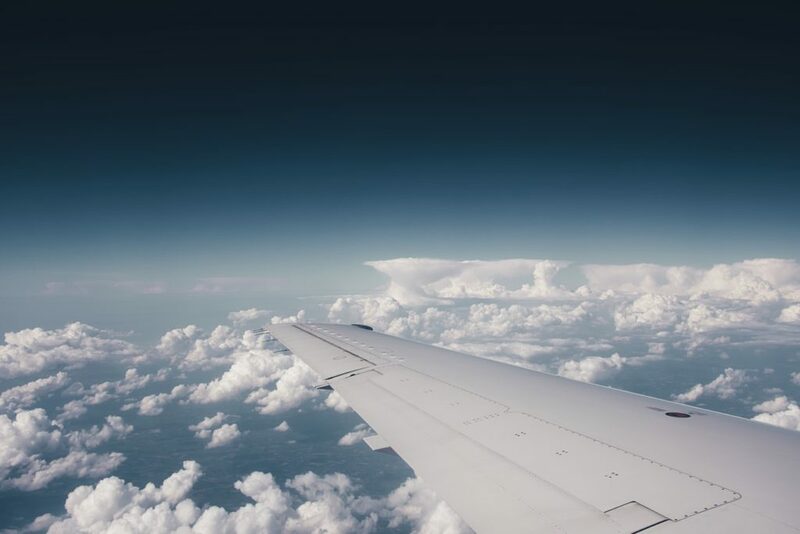 With these 10 tips, long flights will no longer be something you dismay in your traveling experiences! If you plan to sleep most of the flight, then you should pick the window seat because you can rest your head on the side and no one will be waking you up to go to the bathroom. But, if you plan on staying awake for most of the flight then consider the aisle seat, so you can get up as you please. It never hurts to ask the flight attendants if you can upgrade your seat to first class or if there is another open seat with the extra leg room, because let’s be honest, that extra leg room on a 10 hour flight could be lifesaving. If you are going to be sitting on a plane for 5+ hours, dress comfortably! Wearing lose, stretchy pants or sweatpants is great for sitting for hours and being able to adjust, stretch your legs, and curl up in a ball on your seat. Always wear comfortable shoes for walking purposes, and bring a jacket or sweatshirt because you never know if you are going to be cold on the plane or not. If you struggle to sleep on a plane, then make sure you bring enough entertainment to keep you busy for your flight. Download movies onto your phone/laptop/tablet beforehand. Bring headphones and make playlists with different genres of music or podcasts. Books are also a great way to kill some time because they are time consuming and always helps with sleep. Cards are a great way to keep yourself entertained, as well, or even make a friend on the flight. 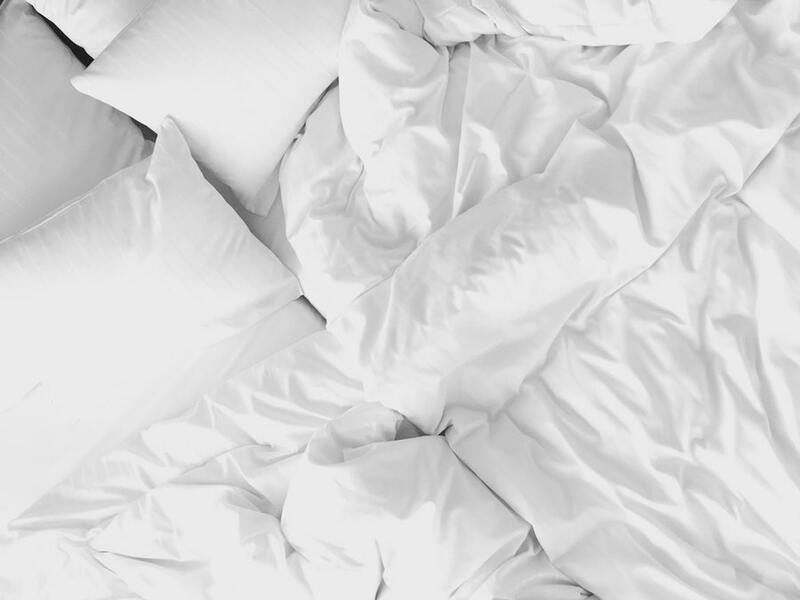 Sleep is important for traveling and we know it’s not the easiest thing to sleep on the plane, so make sure you bring a pillow/neck pillow, blanket or sweatshirt, sleep eye mask, and if needed, a sleep aid helps for flights over 8+ hours. Sleep is essential so when you land, you can start your trip on a positive note instead of feeling exhausted and wasting the day sleeping. Before your flight, make sure if you are utilizing your electronics, keep them charging. Also, for the flight, bring a portable charger to keep everything charging. You don’t want to have 6 hours left on your flight, and your tablet died in the middle of the movie. So, be smart, keep your electronics charged and invest in a portable charger. It is important that you maintain your health while on the flight. We know plane food isn’t the best tasting for you, but by eating you are maintaining your nutrient levels, giving you the right amount of energy. So, make yourself sandwiches, dried snacks like nuts or trail mix, crackers, anything solid that can pass through TSA. Pack smart, but pack healthy. Just kidding, but not really… Stay hydrated! It is super important to drink lots of water on these flights because the elevation levels can throw you off and being confined to a tiny space can almost make you feel dried out. So, pack an empty reusable water bottle, and keep drinking because you are going to need your energy when you land. After sitting on a plane for hours, you might feel a little dirty, like you need to shower or change your clothes, so bring a mini toiletry bag with a toothbrush, toothpaste, baby wipes to clean up, hairbrush, deodorant, face wash, and a change of clean clothes, so you can get off the flight feeling refreshed and new. This is the number 1 rule of a long flight or any kind of flight, or airport experience. Be respectful! You are all in this situation together, so being respectful, makes for an easy going airplane experience. Ready to book your next vacation? Let us help you with that! 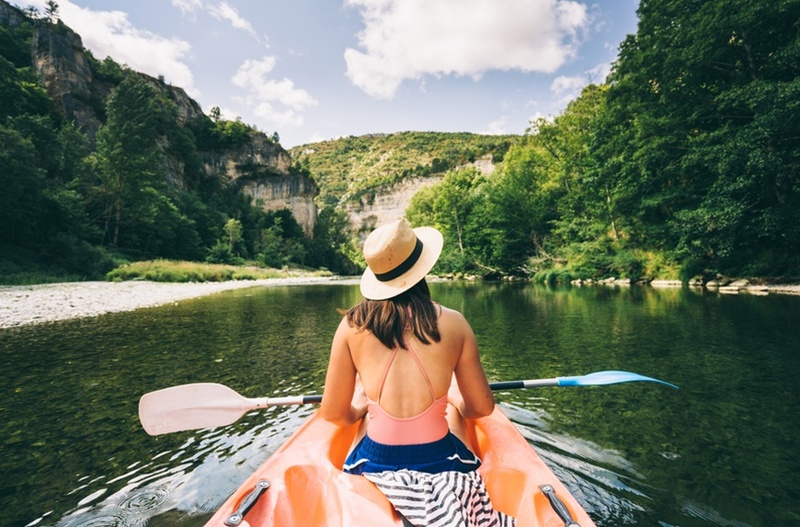 WORKING IN THE TRAVEL INDUSTRY, it is our duty to make sure all aspects of travel are covered, from planning the perfect romantic getaway to packing hacks to traveling with children… We cover it all. 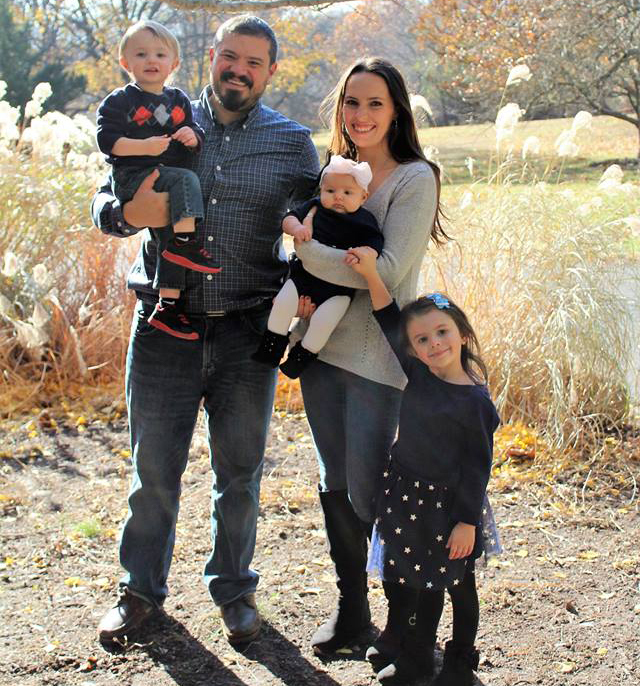 Traveling with children is not my forte because I personally don’t have any, so I took the time to interview my closest friend, Kelly, who is a wife, mother of 3 toddlers, and 2 dogs. 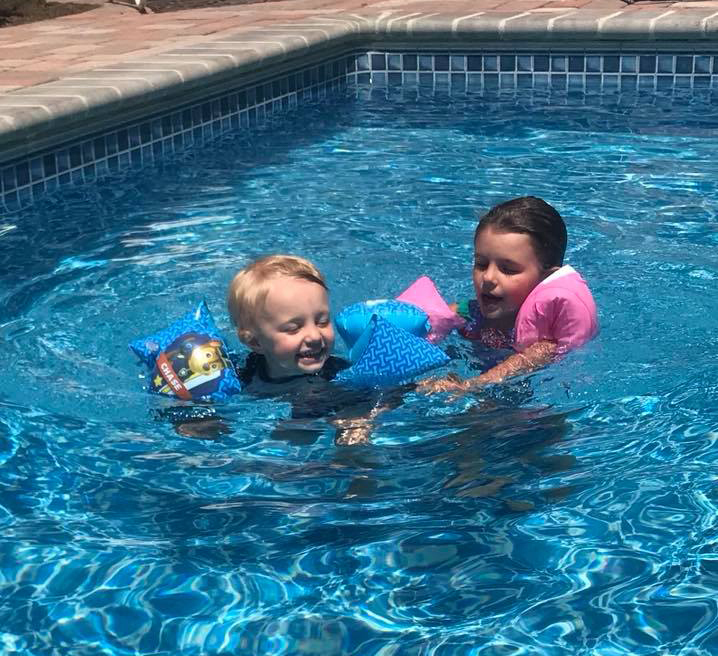 The Dodaro family is constantly going on road trips from their hometown in New Jersey to Nags Head, NC, Hershey Park, PA, Chatham, NY, Pittsburg, PA, Washington DC, and Sykesville, MD. 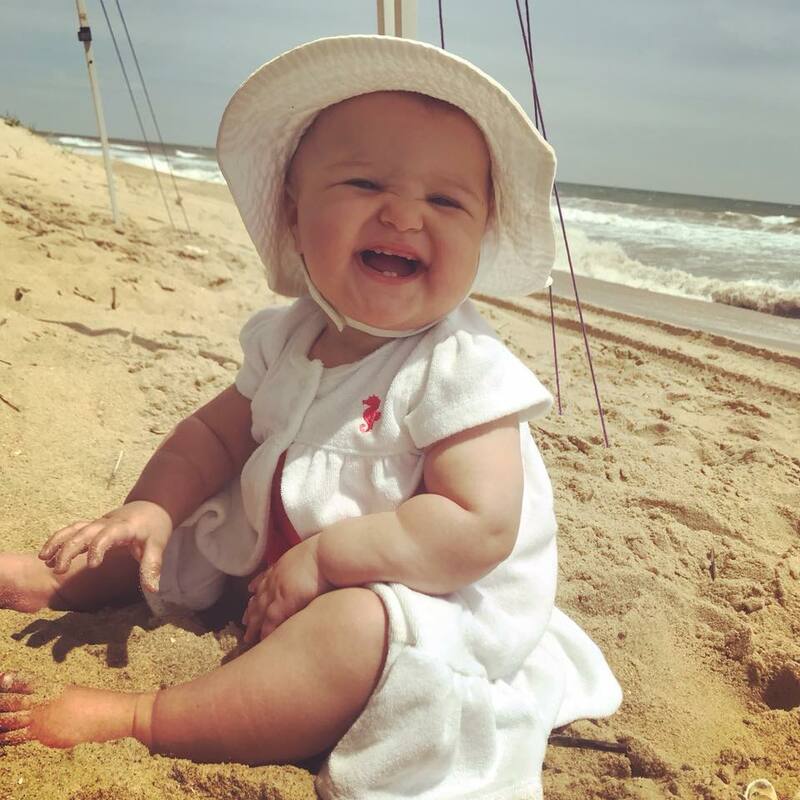 Below are Kelly’s 5 tips on how to survive traveling with toddlers! Tip #1: Pack LOTS of snacks! Nobody wants to hear “I’m hungryyyyyy” or “I’m thirstyyyyy” for hours. Hungry turns into hangry (hungry angry) and there’s nothing worse than 3 hangry little kids screaming and crying in the car or on a plane. Tip #2: If you are into electronics, which these days it’s hard not to be, make sure the iPads are fully charged. Throw on a movie, give the kids some snacks, and you are guaranteed at least an hour and a half of semi-peace and quiet. If a movie isn’t cutting it, download some free kid-friendly games that will keep them entertained. This will make them happy and more importantly will keep them from bugging you every 5 minutes. Tip #3: If you want to work your child’s brain activity, play some verbal games that keep them thinking. For example play the “I’m going on a picnic..” alphabet game. Each person takes a turn picking out an item they are going to bring on the picnic using each letter of the alphabet. (i.e. I’m going on a picnic and I’m bringing an apple. The next person would say I’m going on a picnic and I’m bringing an apple and a banana.) The key is to remember each item that was said and recite them all back when it’s your turn. Another game to play is “I’m thinking of an animal.” One person thinks of an animal and gives clues about them. The players can ask yes or no questions and guess until they come up with the correct animal. It’s a lot of fun and makes children think and learn new things without even realizing it. Tip #4: Coloring books and crayons/colored pencils/markers are always a simple solution to keep kids entertained. Tip #5: What child doesn’t like a dance party? Make a playlist of your child’s favorite songs, crank up the volume, and dance the long car ride away of if you are on a plane, give them headphones and let them entertain themselves. They have fun, you have fun, and honestly, it’s funny watching your little kids create their own dances. TOO BAD EVERYDAY CAN’T FEEL LIKE VACATION. Unfortunately, you’ll be sitting at work to pay the bills, writing papers in school to get an education, or your home is just filled with clutter and chaos because you’re too overwhelmed to get it together. Life happens and when it does happen, it hits hard. But with the help from these wonderful essential oils; they can make you feel so calm and relaxed, you thought you were on vacation! Essential oils are the new au natural, anxiety and stress relief remedies. There is no need for pills anymore when you can just smell a few drops of these oils and completely change the whole vibe of your day! Inhale them deeply, add some to your bath or shower, diffuse the oils into the air, or rub a little on your nostrils, palms, temples, or feet because everyone should feel like there on vacation every day. Lavender is number one in being a stress reliever. Its scent is light, flowery, and super calming. It relieves nervous tension, anxiety, emotional damage, improves sleep, and can relieve pain. Add the scent to the air, listen to a beach white noise on YouTube, dim the lights, and take a bath and you will feel as relaxed like you’re on vacation. Here’s another essential oil that could be the new au natural remedy to relieving depression. Bergamots combination of spicy and citrus is a complex scent that gives you the perfect amount of R&R (reduction & relaxation). It reduces nerve tension, anxiety, stress, high blood pressure, insomnia, and depression by relaxing your nerves, your anxiety levels, and it’s an antidepressant. 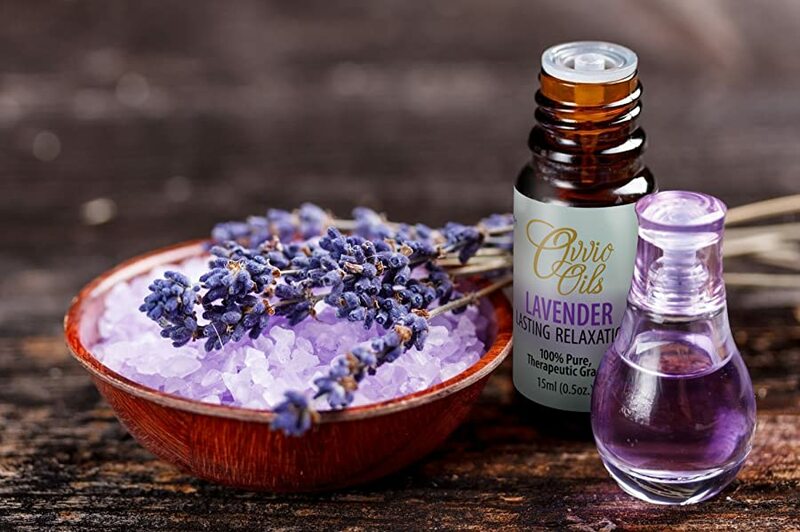 Just like lavender you can place it in the shower or bathtub, rub it on your skin, and inhale deeply for its warming effects to overcome any stress. Tea Tree, also known as Melaleuca oil, comes from the Melaleuca Alternifolia tree. The benefits of this oil make it a must-have for every home. Benefits include mental cleansing from stress, anxiety, or physical pain, it soothes skin from irritants or burns, and can be used a great household cleaner, keeping your home smelling like a relaxing day outdoors. With one inhale of eucalyptus you will instantly imagine yourself outdoors. The smell is unique. It is piney, but minty, with a hint of warm honey. There are so many health benefits to eucalyptus; improves respiratory circulation and immunity. Just rub a little in your hands, inhale deeply through your nose or mouth, and it will open up your air ways, your sinuses, your chest for clear breathing, and all that tight tension you were feeling in your chest, will just disappear. When I think of lemon, I think of a lemon in my cold water, iced tea, or cold cocktail, and when I think of a cold beverage, I think of being somewhere tropical and hot. This citrus not only tastes good, but also smells good! Smelling the cent of lemon will stimulate your mind into daydreaming about an island escape, which will enhance your serotonin levels, and bring you to a state of complete tranquility and happiness. This is another citrus smell that will stimulate your mind into thinking you’re on an island. Only, the difference between lemon and orange, is that orange energizes the mind and body. It uplifts the mood and energy levels, so that you are ready to go, go, go. You can diffuse this around your home or take a moment at work to meditate your mind with the scent of wild orange and enhance your performance and keep you charged. 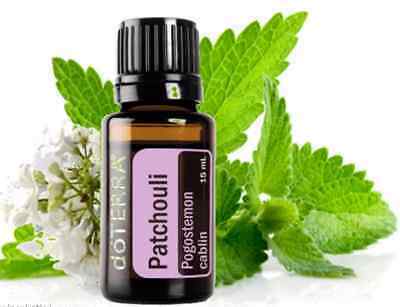 Patchouli is from a plant called, Lamiaceae, commonly known for being part of the mint family. The scent is warm and spicy, also referred to as “the scent of the 60’s”. 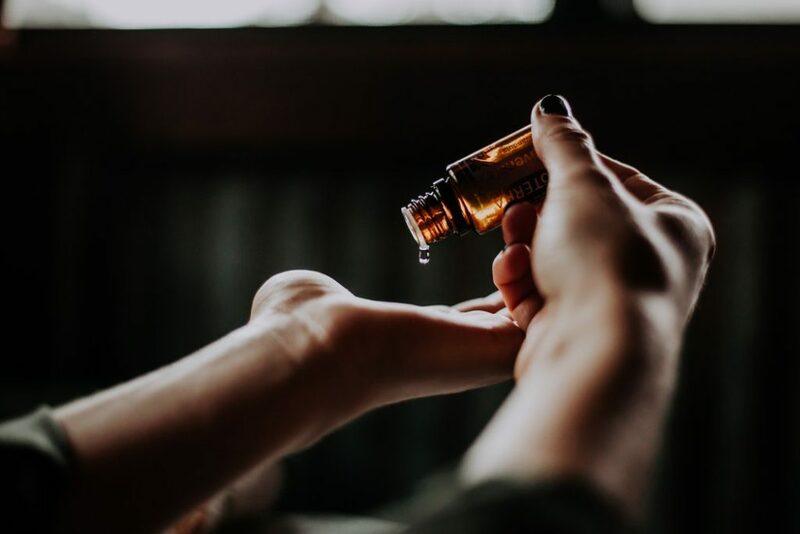 Rubbing patchouli oil on your wrists and temples relieves stress, anxiety, and depression, making you feel like you just woke up from a nap on the beach. Comes from the tropical flower Cananga Ordorata Genuina, It is the “flower of all flowers.” It’s sweet floral scent is an antidepressant, enhances relaxation, and lowers blood pressure (frustration, anger, anxiety). This would be another oil that you could put in the bathtub, listen to some calming music, and imagine yourself on a beach with no stress! Gut-friendly ginger is great for reducing nausea, stomach knots, pains, or upset stomach. Sometimes when stress happens or nerves, our stomachs react first. 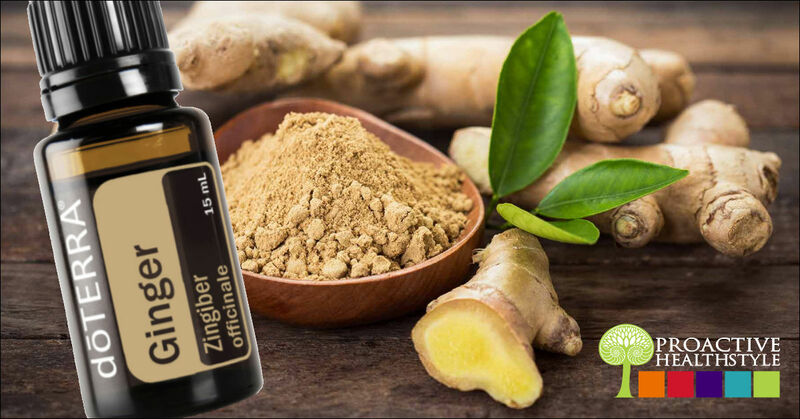 With the potent and powerful scent of ginger essential oil, one sniff is a quick remedy for calming our minds and bodies, especially our stomach muscles. This could be great for pre-travel nerves the night before or before your flight. Also known as, Sea buckthorn Oil, comes from a berry called Hippophae Rhamnoides. 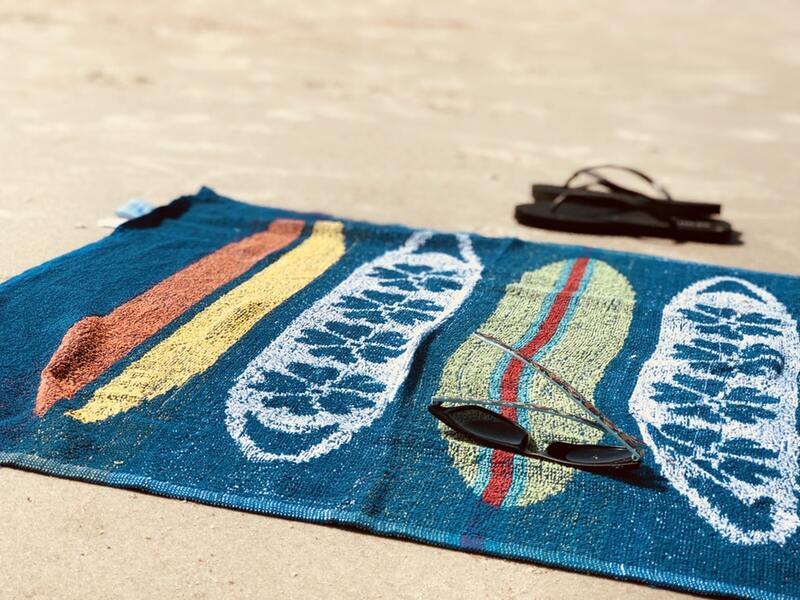 It is the new go-to vacation essential if you are going to be on a beach. It is the au natural remedy for your skin. After laying in the sun for hours, you feel crispy and dried up, you might be burnt or just added to your amazing tan, either way rubbing Seaberry oil all over your skin is great for anti-aging, skins elasticity, heals burns, and rejuvenates skin. ONE OF THE BIGGEST STATISTICS that will make you say “What!”, is the fact that 54% of America don’t take vacation time! I know! I thought the same exact thing when I read that. Not only is vacationing amazing because you get to spend X amount of days on an island, relaxing, while you have servers pamper you all day long, and get to walk around in a bathing suit without being judged… There are also some serious benefits that will improve your quality of life. Life is rough. You wake up, go to work all day, take care of your kids (or furbabies), clean and feed whoever is in your household, go to sleep, wake up, REPEAT. There’s no time in there for you to take care of yourself. While you are on vacation, you get to sleep more, eat more, soak in some Vitamin C, and give your body and mind a break. 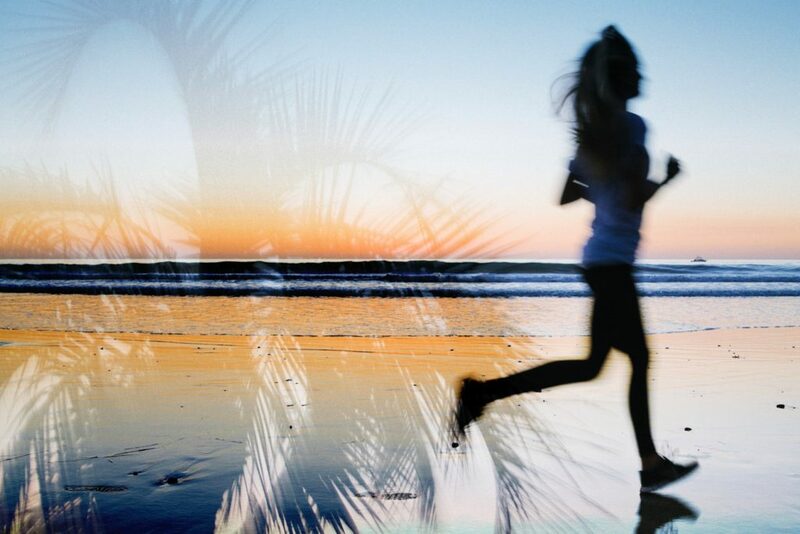 According to science, you can increase your health by 20% by taking one vacation. 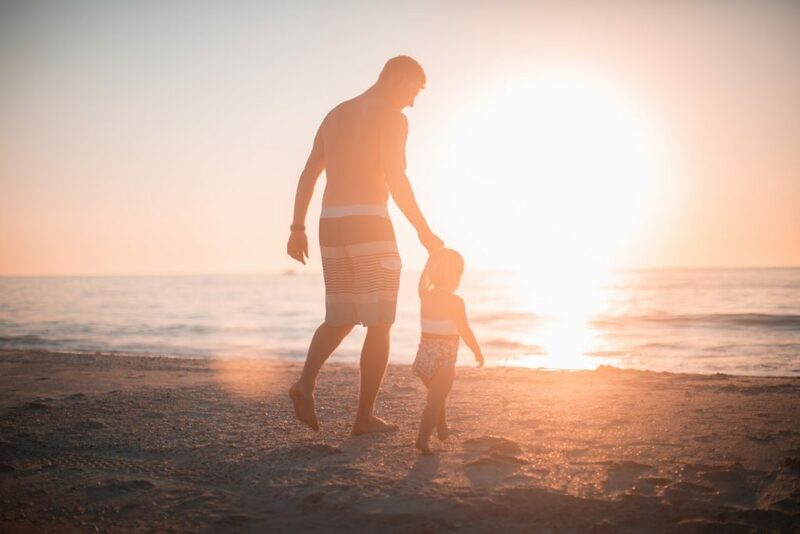 Whether it’s the pressure at work, from your family, or just having a super busy schedule; taking a vacation gets you away from all the chaos in your life. It will dramatically reduce stress, anxiety, and mental and physical burnouts that you are feeling. Just like a battery, if we are over worked without a break, our batteries run low on juice. If our battery is low, we lose our creativity, our patience, are less helpful and hardworking, and make poor decisions. That’s why a few days on a vacation is beneficial, so that you have time to recharge your batteries, refuel and refresh yourself, and return energized. When your life consists of focusing on everything else around you, but yourself, you are reducing your quality of life. Taking a vacation will give you the opportunity to reflect on yourself and the changes you can make to improve your lifestyle to make it better, make you realize the care you need to give to yourself, and a sense of peace. Experiencing an island escape will be good for your mind, your body, and most importantly, yourself. Science says taking a vacation improves your happiness, so don’t you want to be happy? Then take a vacation! ONE OF MY TOP ESSENTIALS FOR A PERFECT BEACH TRIP, is music! I mean nothing is more blissful than soaking up the sun, sand between your toes, staring at the ocean, with a cool breeze in the air; so why not add music to really put you in a tranquil state? 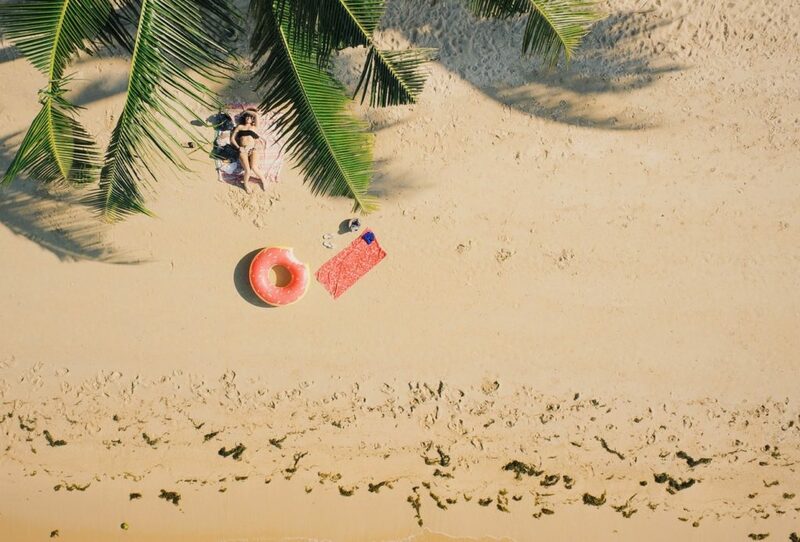 We have conducted the ultimate beach playlist for your enjoyment! 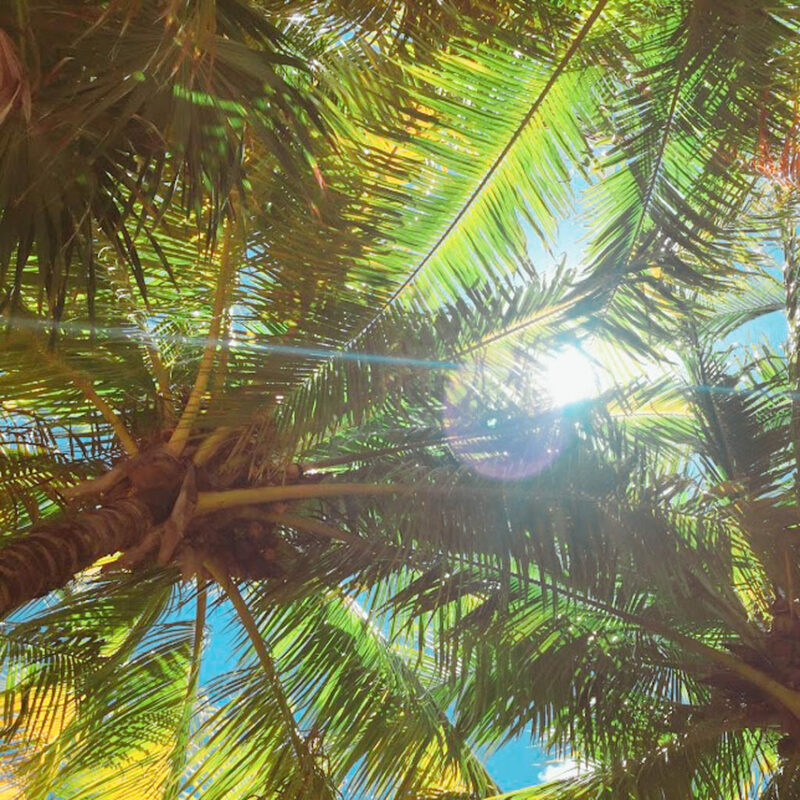 A mixture of a little old school, a little new school, a little tropical paradise, and a little alternative; the perfect combination to blast in your ears while you’re laying out on the beach. BEING PART OF THE TRAVEL INDUSTRY, we LOVE travel hacks that will make life that much easier. Especially, when it comes to packing. Packing is never easy. It is actually very stressful, and we never know if we packed enough or we always tend to overpack. With our little tricks and tips, we will be able to help take some stress off of the whole idea of packing. If you’re going on a week trip or a a month long excursion, there is no reason to bring an outfit for every day! That takes up too much room in your luggage and you’re more than likely not going to wear all those items. Your best bet is to pack items that are diverse. Items that you can mix and match and also dress up to dress down to save space. That little black dress looks great with heels or great as a bathing suit cover up. The button down collared shirt can be worn causal or worn out to a fancy dinner. Either way, you can wear an article of clothing more than once, styled differently, for different occasions and still kill it on your vacation! Once again, if you’re like me, then you can’t stand that smell of plastic on your clothes from your luggage when you unpack your stuff. So, A little trick is to pack loose dryer sheets throughout your luggage; in your shoes, between clothing items, in pockets, WHEREVER YOU WANT! It keeps your clothes fresh and smelling like clean laundry. This is optional, but if you are packing a few pairs of shoes, then you can pack your undergarments inside your shoes, with dryer sheets. Socks, bras, underwear, whatever you are able to roll up or stuff, it saves space by packing those smaller items into your shoes, if your shoes are going to be taking up space. These 2 items are key for keeping your liquids and toiletries safe. 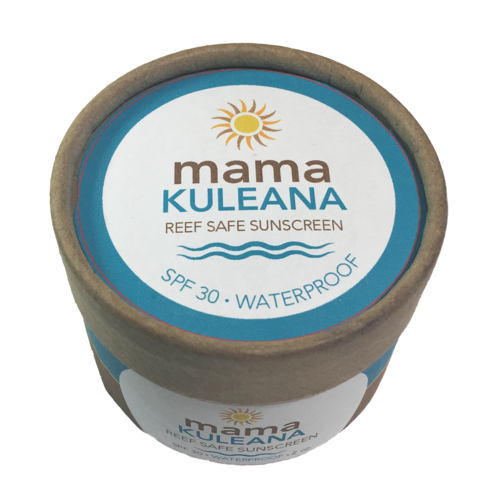 If you are bringing bottles (shampoo, conditioner, lotion, sunscreen, etc. ), then wrapping a small piece of plastic wrap around the lid, is great to ensure no leakage. Also, for extra security, place these wrapped items in a ziploc bag. Have you ever had one of those moments, where you need your phone charger or headphones and when you go to take them out, they’re all tangled? Yeah. If you said no, you’re lying. So, to keep those pesky wires organized, you can take an old sunglasses case, roll your wires separately, stick them in the case, and because of the soft fabric inside and tight space, they won’t roll around and get tangled. Plus, they are easy to access and tiny enough to not take up too much space. Just like the wires, it is the same thing with jewelry. Because of the chains, they all get tangled, then they get tangled around your dangling earrings, and chunky bracelets. 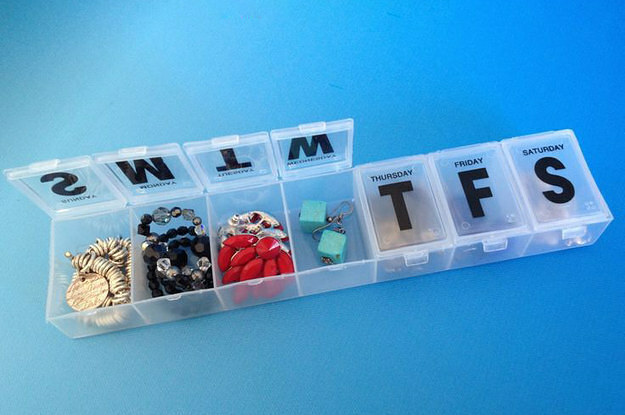 Save yourself the stress and get a daily pill container and pack each item in the separate slots. It keeps your jewelry organized and you less stressed that you have to spend a half hour untangling the chains. Health and safety is very important when it comes to traveling. Nothing is worse than forgetting your stomach medicine or fever reducer or if your clumsy, tripped, and cut your hand; you are going to need bandaids. Make a DIY (do it yourself) first aid kit. This can consist of: band aids/gauze pads/medical tape, Neosporin, travel sized tissues, pain reliever/fever reducer, prescribed meds, motion sickness medicine, allergy medicine, eye drops (just in case), and insect repellant. All these items can be found in travel sizes. It is better to be safe, then sorry! Be smart and pack your essential items together in your carry on, for easy access. Your wallet (ID/passport, credit card, etc. 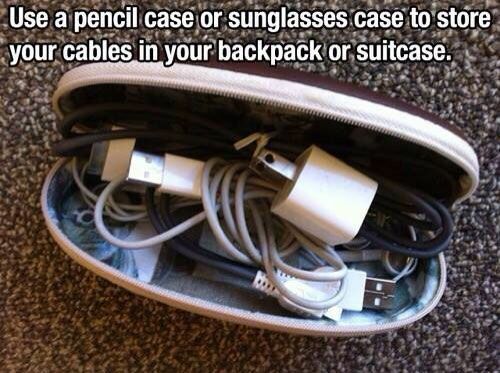 ), phone charger, headphones, laptop, book, sunglasses, and medications/med kit should all be kept together in your carry bag, so that it easy to get to and organized. 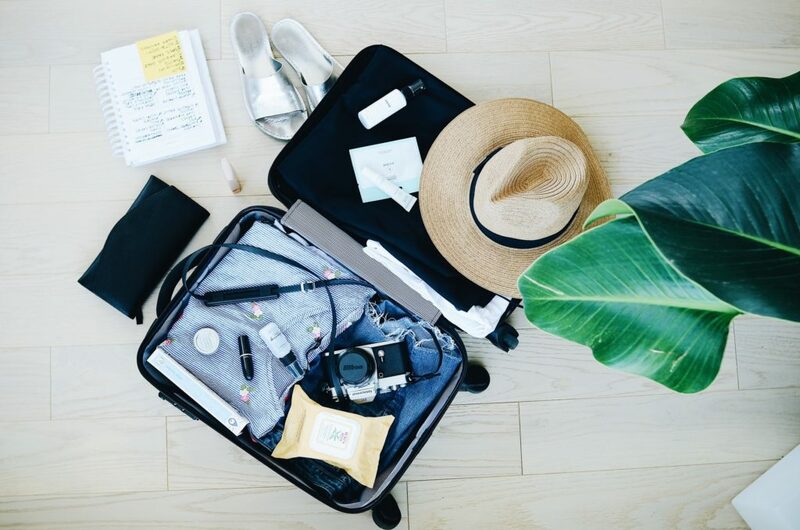 With these tricks and tips, we can help make traveling less stressful and keep you organized! EVERYONE, FROM GENERATION Z TO BABY BOOMERS, seems to be obsessed with their electronic devices. Whether it is their iPhone, tablet, gaming console, etc., it seems like we are always plugged into our devices more than we are plugged into the actual world around us. That’s why, when we’re on vacation, we need to put the electronics down and try to forget about their existence. Put the devices down slowly, walk away, and actually enjoy the beautiful world that surrounds you! How often do you go out to dinner, look around, and see a family of five with their noses in their phones instead of actually engaging in conversation? How many times have you been that family? How often have you gone into a mandatory work meeting, and instead of conversing with your co-workers and asking about their new puppy or their kids, you’re scrolling through social media and praying that nobody tries to talk to you? How often are you at a party and nod your head at the person who is trying to engage in conversation with you, wishing they would just go away because you want to get back to examining your Instagram homepage? How often have you tripped over the sidewalk or run into a glass door because your eyes were fixated on your phone instead of on your surroundings (I’m totally not saying this happens to me on a regular basis)? If you said no to all of these, you’re probably lying. 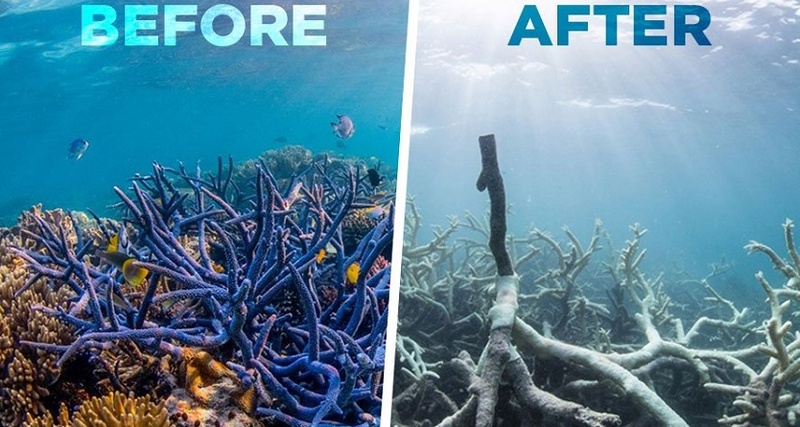 I could go on and on, but my point is, how often are we “too busy”, wrapped up in the online world, instead of paying attention to the very real, very exciting one right in front of us? So, when you’re on vacation, put the phone down and look up. Look around. Take in your surroundings. Enjoy the cultures, the sceneries, the smells, and the activities you’re participating in. The entire point of vacation is to break away from the mundane of your everyday life. But, if you’re still constantly on your device, the only thing that’s different is the ground you’re walking on! Believe me, I’m not against technology. I love Instagram and iMessage; it helps me stay in contact with all of my favorite people! But, vacations are meant for us to disconnect from the outside world, to relax, and to reflect on who we are and what we want out of life. Being so connected to our devices means that we’re really only halfway experiencing everything. We’re documenting this activity on Snapchat and posting this picture to Instagram and checking how many likes you got at this “check-in” on Facebook. 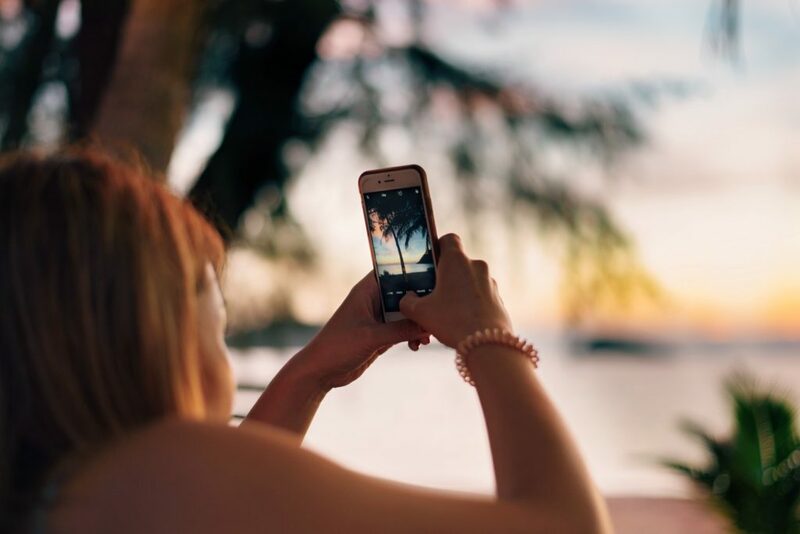 In doing all of that, we aren’t actually enjoying these experiences… we’re actually just documenting them for everyone to think we are having the time of our life, but in reality, we are just drowning in our phones. It’s so important to live in the moment—to be present in our own lives. We tend to think that our online presence makes or breaks us. The number of followers we have on Instagram or the number of friends we have on Facebook is somehow equivalent to our self-worth. But isn’t that silly? You aren’t measured by how many likes you get on your latest photo or how many comments you receive on your newest status update. Carpe diem, guys! Live in the present and enjoy every second of this beautiful thing we get to experience called life.